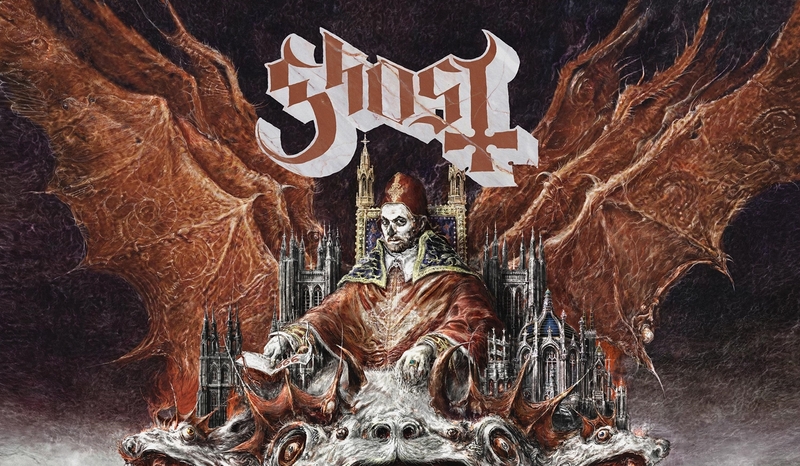 Album Review: Ghost - Prequelle - GENRE IS DEAD! With an immense amount of exciting new music this year, people were still itching to see what Ghost would deliver with their latest record Prequelle, which sees the band ready for a well-deserved break into the mainstream. It comes as no surprise due to the fact the band have been gaining a cult following over the years. Last year the insular nature of the band dissolved when Tobias Forge the founder of Ghost was taken to court by his Nameless Ghouls who had departed from the band. This built towards Papa Emeritus (Tobias) transcending into Cardinal Copia to evolve the band into the next step of their career, which sees them deliver dark morbid lyrical passages inspired by the Bubonic Plague over an 80’s driven soundtrack overflowing with infectious melodies and raging riffs. “Ring A Ring O’Roses” has never sounded gloomier than on opening track “Ashes” which glues together extremely well into the massive riff on “Rats” an arena-ready anthem that’s a blend of Iron Maiden, Judas Priest, and Black Sabbath. The album itself is larger than life and is very prevalent on “Faith” featuring sharp piercing vocals behind a riff that could have easily featured on the Black Album by Metallica. “See the Light” finds Ghost delve deeper into a mainstream scope as we get Queen fused together with Ghost’s overbearing doomy aspects. The main feat on the record comes from the inclusion of two instrumental tracks which doesn’t pull you away from the overall immersion of the album. The first, “Miasma,” greatly benefits from the record’s release during June as the heat brings out 80’s vibes to their full potential accompanied by a saxophone solo. “Helvetesfonster” slowly seduces the listener with the subtle usage of melody over a bleak, dark setting which guides you through the final passage of the journey leading you to the closing track “Life Eternal” serving as a fantastic dramatic close to the album. “Dance Macabre” the latest single from the record, could almost be mistaken as an ABBA song being sung over a Blue Oyster Cult track. The band also gravitates towards a theatrical presence during “Pro Memoria” which shows the band’s boundaries are always going to be pushed further as they delve deeper into their career. Overall, the fourth record from Ghost is one of the standout records of this year, with a multitude of catchy melodic hooks that will entice many to sing along as they embark into a North American arena tour. The record has a lot in common with its predecessors, but still sees the band pushing boundaries by delivering an album full of “Square Hammers.” It leaves you with the question: do we possibly have a future main stage headliner at Download festival? As surely with a record like this, it is hard to imagine Ghost not taking over. Hey! I am Tom, I am from London, England. I am a tad music obsessed and I have a strong love for these artists; Enter Shikari, Jamie Lenman/Reuben, Nine Inch Nails, Employed To Serve, Palm Reader, Letlive. , Code Orange and Alice In Chains. When I am not a gig or listening to music, I am usually gaming.